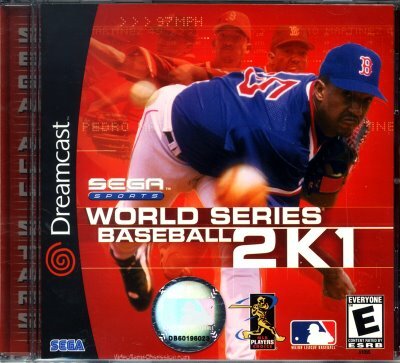 The Dreamcast Junkyard: Samba De Baseball! NOTE: This article has been since proved as rrubbish. See this Follow-up to see why. YES. I knew it. I knew I would find a hidden gem game that can work with the maracas,. There just had to be, as every Dreamcast controller has a game that works remarkably well for it even if it's not mentioned to work for it on the back of the box. With the Fishing Controller it's Soul Cailbur, which the Dance Mat it's Space Channel 5, so what is it with the Maracas? Well, I was determined to find another game that worked really well with the maracas, considering that I had to fork out £75 for them, and while Mr. Driller worked sort of well, it isn't perfect, and more or less every other game I have tried hasn't worked in the slightest. Looking around IGN Dreamcast's archives, there was this article about Samba's release in the US. 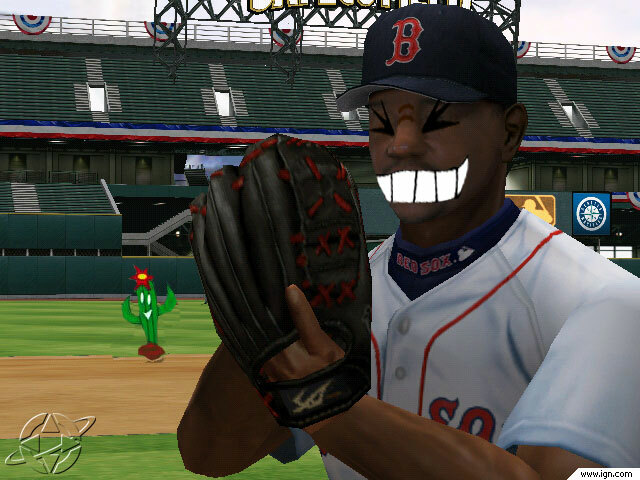 I can't find said article at the moment, but it's tag line was "Don't laugh, but you might just be playing World Series Baseball 2K1 with those maracas". 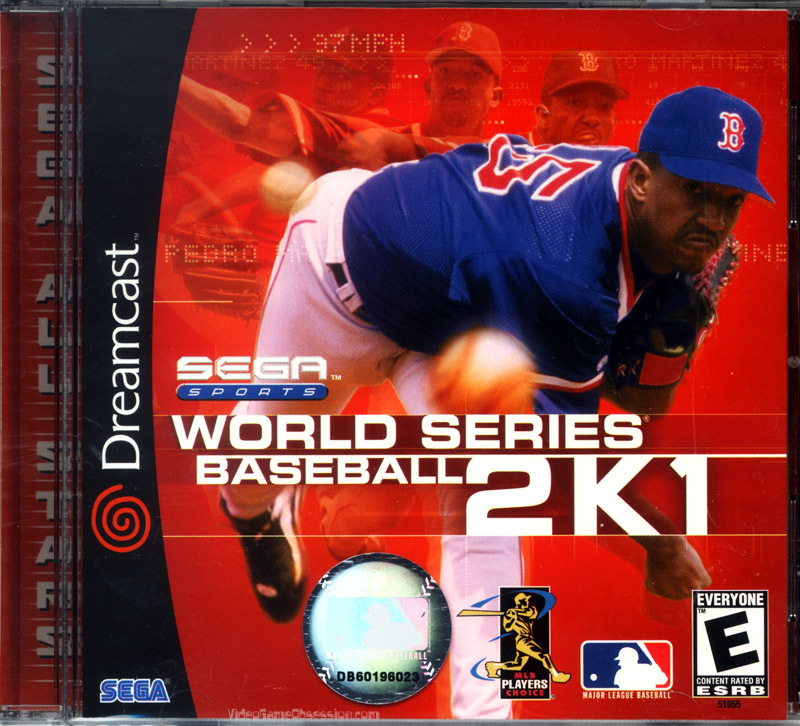 I took this with a pinch of salt, but I own the game from where I picked it up along with two other Sega Sports 2K1 dirt cheap from a Toys R Us in Florida back in 2004 (along with Sega Marine Fishing and Alien Front. When I say dirt cheap I'm talking £1-3 each cheap!) so I decided to give it a shot. Normally I couldn't give a toss about Amercian sport sims, however..
Well, the menu's are not navigational with the Maracas, which gave me a bad sign. Once I got into the game however, using the 2nd controller plugged in, I noticed something different about the in-game layout. Normally the camera angle is third-person from behind your batter, and you get this little window to aim your bat with. This time, the angle was more of a full shot, with the pitcher facing the back of the camera and the batter facing in front. First few shots didn't seem to register so well, but that was maybe because I was using both maracas. I put one down on the floor and had a swing with just the one like you would with a real bat and, holy hell, the character on the screen did near enough exactly what I did! What I lookedlike playing it. Sort of. That's right, you can actually use one of the maraca's (either one will do, it seems) as a bat, and it registers exactly what you do with the swing! Hit it high, the ball will fly high. Hit it low, and it'll roll along the ground. Hit it fast, it goes fast! 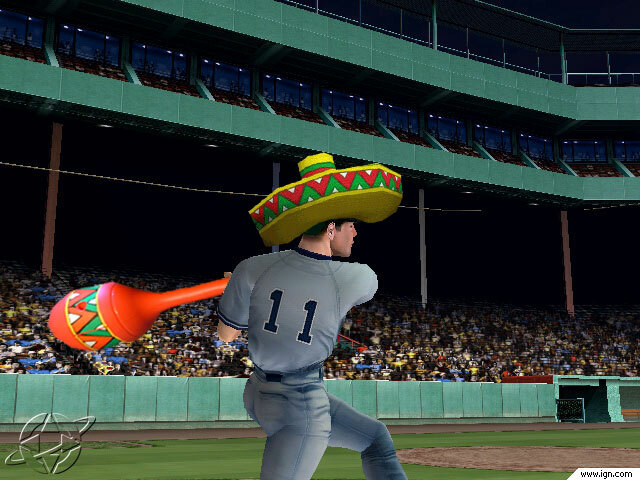 When using the maracas, the CPU plays the other characters on the ground for you, including the pitchers, and with this in mind you end up playing the batting roles of both teams. This should be great for multiplayer, as you could just pass the maraca to he next player when their team's batters come up. 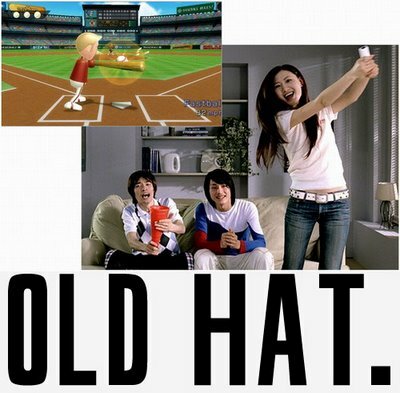 This game was most defiantly made with the maracas in mind, as these alterations to the game play prove. It must actually register the maracas much like Samba De Amigo) only without telling you, and switches to this simpler game play that only involves the batting. Already the players seem to be a whole lot happier about it. What's extra great about this is how it's techniqully exactly what the baseball part of Nintendo's Wii Sports is said to play like, with the only difference being the graphical style. Of course, what Nintendo is doing is taking this expensive (in 2000) technology and making it the norm for all their games, but the fact that it could be done six years ago makes you wonder: What if Sega decided to stick to the console market, and leaped on this idea first? Whatever the case, it’s very enjoyable to think I’m playing a small part of what is essentially being called the future of gaming using a game and controller created yonks ago. Not so revolutionary now, are we? Take note that I'm not slagging off the Wii console itself, but rather just the baseball game. Now of course, being British I haven't got a clue how Baseball works. There's so many terms and rules that I was often confused by it all. Also, on it's own with a normal controller this is a very dull game, and hard to play if you, like me, just don't get it and have to play all the other guys on the pitch. However, this game suddenly becomes another one of those magic game play moments the Dreamcast has so many of when using a maraca, and I'm sure once I get some mates round this will become a multiplayer favourite. What was also quite cute was seeing my dad walk into the room and rather than make a remark about how daft I looked swinging a bright red plastic maraca about, but "Blimey, don't those graphics look lifelike?". Who said the Dreamcast can't still turn heads? Anyway, if you were considering getting the maracas set one day, now you definatly have to get them along with this game so you can glote to your mates when they rave about the Wii's controller.